The screen industry encompasses the development and production of Film, Television, Animation, VFX, Post production and emerging screen technologies and STI works across all these sectors. The development of people and skills in the sector is a crucial component of growth and success and as part of our strategy for Audio-Visual training for the sector STI want to enhance ‘on the job’ learning and development. This will include an increased emphasis on the development of structured apprenticeships and traineeships alongside mentoring, coaching, and shadowing. A crucial part of this role will be the development of a structured environment for Trainees. This will involve developing pathways into the industry, structured modular training and career paths beyond entry-level. This is a newly created full-time position working directly with and reporting to the STI Training Manager. The role will see the successful individual working closely with Producers and individual Heads of Department. This role is primarily about new entrants into the industry, better pathways, school leaver opportunities and graduate opportunities. As part of our commitment to diversity part of this role will be an engagement in disadvantaged areas around Ireland to open career opportunities within the sector. The role will also be working closely with the Higher Education Authority (HEA) and Solas in the development of Apprenticeships and Traineeships as well as individual Education and Training Boards. Developing Apprenticeships across live-action, animation and VFX production. Developing Traineeships across live-action, animation and VFX production. Creating entry points in to the industry for new entrants. Mapping out Career Pathways across the Screen Sector. Developing and maintaining crucial partnerships with the HEA, Solas and the Education and Training Boards. Supporting the Screen sector with the Section 481 requirements in relation to Trainees and working with the Department of Culture, Heritage and the Gaeltacht to monitor the Section 481 effectiveness in relation to trainees. Developing learning initiatives that are appropriate and bespoke to particular production environments. Ensuring there is a diverse and inclusive balanced approach to the work of STI. This role will involve local travel and therefore will need flexibility. Substantial and proven experience of working in the film and television industry — with extensive knowledge of live-action production, animation production and VFX production. Extensive knowledge of the roles within the live-action, animation and VFX sector. Substantial and proven experience of working within in Training in the AV sector. Must have experience of the development of Apprenticeships, Traineeships and other work based developmental initiatives. A forward thinker and ideas generator. A demonstrated commitment to equality and diversity issues. The successful candidate should be aware of the challenges facing the screen sector and how these may be addressed through training and development. Interested applicants are invited to forward a detailed CV that highlights relevant experience and a covering letter in strict confidence to recruitment@irishfilmboard.ie by Friday 27th April 2018 at 5.00 pm. 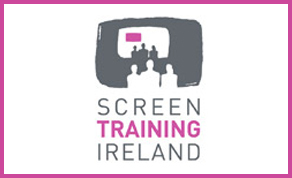 You will also be expected to be conversant with the training strategy ‘Final Report in respect of a Strategy for the Development of Skills for the Audiovisual industry in Ireland’ see www.irishfilmboard.ie and www.screentrainingireland.ie. This is a sanctioned full-time post at HEO level at a starting salary of €47,552 with annual increments subject to performance. Annual leave is 25 days per annum and this post will be part of the Irish Film Board Superannuation Scheme. This position is directly responsible to the STI Training Manager. The post will be based in the STI offices in Dublin. Bord Scannán na hÉireann/the Irish Film Board is an equal opportunities employer.